Everywhere, craters. On the moon, on other planets, here on earth. Ancient craters, forgotten craters, undiscovered craters. And craters down on the farm. The first explosion rocked the farm in Venice, NY during the night of November 12, 1966, and the next day a mysterious small crater was found. The NY State Police investigated, an Air Force officer showed up, Cornell University took an interest and geologists from Syracuse University obtained samples. Eventually, the State Police provided me with photos, there was correspondence from the Air Force and a lengthy report from the geology department at Syracuse U. Strangely, while no evidence of explosive material at the site could be determined, nor was there any indication of a meteorite impact, despite intensive geologic analysis. But the mystery deepened. Exactly a year to the day later, another explosion and crater appeared on the farm, and the same series of events occurred exactly a year after that. My Air Force enlistment effectively divested me from further action regarding this increasingly suspicious situation, and I'm unable to provide a final explanation-- if there was one. Should I locate the original crater photos, I'll post them, but in the meantime here are letters from APRO about this and other matters, an excerpt from an A.P.R.O. 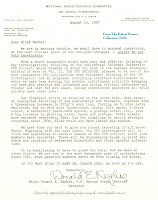 Bulletin of 1968 and a letter concerning the crater photographs from the State Police. Incidentally, Coral Lorenzen's reference to "Dell" meant Dell Publications (mentioned a few blog entries ago here), which had apparently written favorably of APRO, resulting in a cascade of letters from people interested in UFOs. Every year, thousands of young men and women attend Air Force basic training at Lackland Air Force Base in Texas. In 1968, I was one of them, and one humid summer's day in a classroom we were treated to an official publication of more than passing interest. In miniature, here are notes I made at the time on two small memo pages, later stapled to an information sheet. Twelve years later, I wrote a brief article for The A.P.R.O. Bulletin (APRO no longer exists) with illustrations from memory, as shown. Obviously, this military manual was viewed by countless thousands of airmen. For how long, I wonder? Interesting, if little else. Involvement with the UFO subject can drive us in many directions. For some, detective work comes into play. For others, the exposure to scientific discipline is invaluable, and a number of researchers, on both sides of the issue, have found the UFO appropriate as university thesis material. Still others, unfortunately, often with pre-existing problems, latch onto the subject in ways that drive them to the depths of crazy, even to suicide. That's why, for me, it was great to be on the receiving end of that occasional word of encouragement from somebody of note who "gets it," that rare individual of status who suspects the game is afoot and worthy of concern. One such person was J. Leonard Gorman, the late former Executive Editor of The Post-Standard (Syracuse, NY). 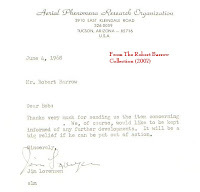 During his many years at the newspaper, numerous articles about intriguing UFO sightings appeared on its pages, and most of my letters to the editor about the mystery saw print. I had the pleasure of meeting Mr. Gorman personally only one time, in the 1970s, an occasion when I had to visit the newspaper building on another matter, and the two of us literally passed one another in an empty hallway. What a kind, soft-spoken and impressive man he was, never once shouting "Great Caesar's Ghost!" like Perry White, who is probably many folks' vision of a newspaper editor. So, how extraordinary it was of him to send me this little note when he learned I was headed for the Air Force back in 1968. It's true -- little things mean a lot. "I'll not be driving on that road...alone at night"
Things, strange mind-gnawing things were happening in Central New York while I was far away in Texas, attending Air Force medical tech school. UFO-related mail and phone calls routinely made their way to my family and they, of course, would pass information along to me. Even at a distance, I tried to assure that report forms were completed and submitted to NICAP or APRO by concerned sighting witnesses. In the fall of 1968, months after my departure for Air Force training, something bizarre occurred in a rural area of Upstate New York. Had I been available, it's for sure I would have checked this one out thoroughly. Fortunately, the primary witness typed out a lengthy account in addition to the standard report forms submitted to others and mailed me a copy, including a map. Today I'm posting her five-page summary, and once again I feel like a government censor with a specialty in redacting because I've whited out a bunch o' stuff. Why? I believe the primary witness is possibly deceased, but there appear to be numerous family members left behind. 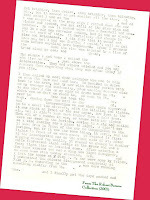 So forty years later my predicament is, should I contact survivors to see about getting permission to leave numerous items in her report -- but in doing so, would I actually risk encouraging a tug-of-war as family members take on opposing sides, muddying the waters, so to speak, until I'm left with a document whose appearance rivals even more well-holed cheesecloth? In addition, there are several other names listed, providing me a whole new round of permission-to-use headaches. Instead, I'll opt for the version I've posted. 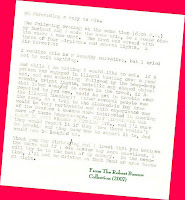 The narrative will be a bit hard to follow and the copy is faded (I enhanced it a little), but what you will discover is a potential UFO case suggesting electromagnetic effects (car), an animal reaction (dog), physical evidence, multiple observations by multiple witnesses and possible military involvement after (and during?) the fact -- all topped off by the question of whether illegal hunters in another place, at another time, might encounter problems with the law if they report their experience involving a UFO with portholes and beeping sounds! As 1967 slowly evolved into 1968, with the Vietnam Era still a pressure-cooker in progress, my thoughts and time became increasingly consumed with the stark reality that I was going to be drafted into the military. After exploring enlistment possibilities, I would enter the Air Force in June of '68, exactly a year after high school graduation. College courses in the meantime had become something to occupy the days, so I attended one class at a time, barely completing a second before leaving for four Air Force years. 1968 also turned out to be a year notable for UFO reports in Central NY, and I became involved in convincing witnesses to complete report forms for NICAP and APRO. 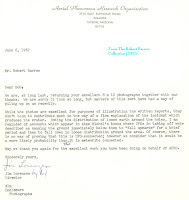 Unfortunately, fallout from the Ithaca and Newfield, NY UFO reports and controversy continued. Today, I've posted four more letters from APRO, this time received from both Coral and Jim Lorenzen, from January through June of 1968. You will immediately note numerous blank spaces in the body of these letters, and these occur because I've deleted all references to the troublemakers, the fraudulent UFO "investigators" who caused so much friction in the Newfield situation and caused me to get dragged into assisting the Air Force covertly (wow, that still sounds weird). The State of NY, by the way, was instrumental in putting these bad guys out of business, so it's not as if their names aren't easy to obtain. Historically, the APRO letters serve another purpose. As you can see, in one letter reference is made to the fact that some good people involved with the Colorado UFO investigation have either resigned or have been fired. 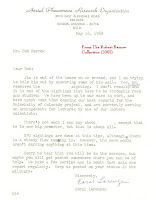 In another letter, one of the Lorenzens makes it clear that the whole miserable Colorado project is falling apart -- unwelcome news, particularly because APRO, like NICAP, labored to provide extensive UFO evidence to the study, now all for naught (look for an old paperback book entitled UFOs: Yes! by former project member Dr. David Saunders, one of the "good guys" who left the Colorado project). The other subject of interest in these letters is Coral's request that I might be able to provide information while in the Air Force, as do "a few" servicemen who report regularly to APRO from Southeast Asia. There were UFO reports known to originate in Vietnam, and apparently APRO remained focused on the potential for credible information from military members. 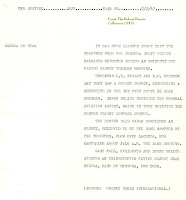 In fact, as I type this I'm pulling out a snippet of something in my old files about a '68 Vietnam report involving a fast-moving UFO over the U.S. Marine base at Dong Ha. An airborne helicopter crew watched the thing and, according to the pilot, "My gunners were scared to death and radioed, 'Let's get out of here!'. . .I never believed in these UFO stories before, but I do now." I was about 18 when I hauled up the courage to contact Syracuse Magazine, "Magazine of the Good Life in Central New York," assuming from the start the impossibility that this regional publication about dining, travel and other pursuits of the masses would entertain the slightest proposal for an article about UFOs. As a teenager, I had already been hammered multiple times by various editors of national publications who couldn't help but find my early articles or ideas unusable. Can you even imagine the load of crap editors receive from freelance writers of little or no talent every day? This time, somewhat secure as a successful newspaper letter-to-the-editor contributor (!) 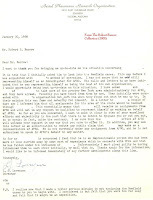 for almost two years, I was ready for the big time, and at this point in 1967 simply collecting letters of rejection served as an endorsement of perseverance. How surprised I was, then, when the magazine's editor, Marilyn Dietz, responded that she liked my idea for an article about UFO sightings in NY State. The late Ms. Dietz, chronically ill much of her life, was praised particularly for her community work with the elderly and disabled, so her interest in publishing a UFO article in the mainstream Syracuse Magazine really floored me. But after several delays, my article, "Unidentified Flying 'Somethings' Over New York: A Look at the Past," saw print in the Third Quarter, 1967 issue. For visuals, I included two famous UFO photos, and even though the captions were inadvertently switched on each by the time of publication, that flaw was easily overshadowed for me by this literary accomplishment of sorts. Apparently, the readership offered a positive response, because when I asked Marilyn about writing another piece she was overwhelmingly for it. Unfortunately, a series of disagreements with her publisher about various matters precluded a second article, and in fact the magazine eventually faltered and was resuscitated through a weak succession of revivals by other companies in years to come until it no longer resembled its origins. 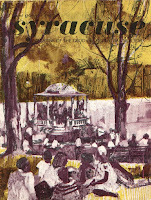 Forty years later, fondly remembering my first magazine article, certainly nothing of Pulitzer quality (I haven't provided a complete or clearly readable copy here, as the content is really irrelevant at this point), what sticks with me most is the fact that they printed Syracuse on glossy paper. Of all the national magazines and other more far-reaching publications I've written for, these old issues remain the ones printed on the best quality paper, the glossy pages once standard for many newsstand magazines, and as the other magazines' pages continue to yellow and fade, Syracuse Magazine issues look as fresh as if they were printed last week. It's really strange to ponder that they'll be the only ones left one day after all the others turn to dust. I wonder if taxidermists preserve magazines, too? A necessary "thank you" here to veteran journalist Billy Cox for writing some good things about me and this blog in his own Blog De Void, affiliated with his newspaper, Southwest Florida's Herald Tribune. Described as "The mainstream media's lonely UFO web log," his regularly updated reports about all things UFO are nearly anomalies in themselves because he's an established newspaper reporter -- a credentialed journalist -- writing on a continuing basis about UFOs. AND, yikes, he gets it, the truth, the nonsense, the questionable, all of it. UFOs? This guy with blog in tow has to be as lonely as the Maytag repairman amongst his fellows. Legitimate reporters who stay in tune with this subject and the editors who allow them to do so are a rare bird indeed in the U.S., so please be sure to check his blog often. I don't add web links haphazardly here, so when I announce tonight that I'm adding De Void to my list on the right, know that it's something special. Oh, good grief, I found this letter, lost it and then found it again. Next time this happens, I just know it'll disappear for good, like socks in the dryer. Or is that socks in the washer on the way to the dryer, or socks before they reach the sock drawer? Or does the real activity occur inside the sock drawer? Danged sock gremlins always leave the ones with the biggest holes behind, did you ever notice? The letter displayed here? I really like this one. William F. Walsh was the mayor of Syracuse, NY in the sixties and also served as congressman for a few years. He's retired now and his son James has been a Central NY congressman for numerous terms. Answering my letter about various UFO concerns in 1968, Mr. Walsh certainly knew how to inflate one's ego, suggesting that folks like me might be right and the skeptics, hmm, may be ever, ever so wrong. As if that wasn't enough, he also suggested that research into the UFO issue should continue. All in all, this is one of the most refreshing UFO-related letters I ever received from a public official. 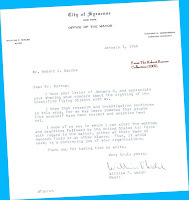 My only addendum nearly 40 years later would be yes, Mr. Mayor, I am correct (well, if not about UFOs, at least about something), and yes, the skeptics are wrong -- primarily because most of them aren't really skeptics, they're merely debunkers attired in skeptical clothing, and they add nothing to UFO research and investigation. In a way, it's like a dream. No, actually it is a dream, the kind that only poses as still life for a split-second: The misty vision of a faded metallic exterior, a disc shape entwined in the cobwebs of antiquity. No, it isn't a UFO, just a film container, one of several, stubbornly protective for over 50 years of the motion picture reel inside. All but forgotten by theater patrons shortly after a lukewarm international premiere, the film's faint glow lives on now only because the people who know about UFO history provide the interest, the cinematic spark of life -- life support itself -- for its resurrection. Yellowed promotional material carries the full title: "UFO: The True Story of Flying Saucers." But most of us just call the movie "U.F.O." The dream, the Gothic mist, the cobwebs mysteriously unoccupied by the phantom spiders who allegedly spun them into angel hair, how cunningly they enhance the terrifying wrinkles of time, all the while concealing things of paramount importance. . .
A change of plans. My original intent here was to regularly include documents and photos relating to the 1956 full-length documentary motion picture, "U.F.O." But as you and I have continued sharing so many miscellaneous documents and events through the months, exploring other areas of the UFO subject, it's become clear that this unique and important film deserves its own Internet site. The "downside" right now is that I still need to find items filed away decades ago, and time to put it all together is another consideration because I really want to keep the current blog going until most of what I feel essential is posted. Having warned you initially of what an un-pack rat I would be with this blog, I harbor no illusions that some of my "essentials" don't qualify as your essentials, of course. However, I do want to offer something of a prelude to tease you a bit, so the least I can do is offer a few paragraphs about my interest in the movie and my relationship as a writer to it. I'll remind you, too, that if you go to nicap.org and enter my name in the search engine, you can find my two oldest articles (now with photos) from the seventies about "U.F.O." NICAP's page of items for sale, with all contributions going to support the NICAP site, offers the movie itself, too. Should you prefer a French translation, or if you don't understand French but want to impress your friends by telling them that you read and understood every word offered in that language (! ), the site, ufologie.net offers my earliest movie article (" 'UFO' Revisited") in both French and English versions. Now, allow me a few paragraphs to introduce you to my interest in the film. 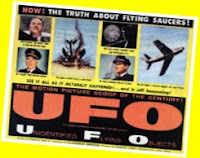 . .
About The 1956 Movie "U.F.O." When I first saw the 1956 United Artists documentary motion picture, "U.F.O." on TV in the mid-sixties, I could hardly believe my eyes. UFO history had been my interest as a teenager for a while, but I never even heard of this seemingly obscure film. Yet, it held a spellbinding attraction for me. Because much about it concerned the real life of Air Force spokesman Albert M. Chop, whose hardened skepticism transformed into overt acceptance of UFOs as a real phenomenon with apparent intelligence behind its identity, Chop was always of interest to me. I wanted to ask him a few questions about his life and the movie based in large part on his government work. Locating him wasn't difficult because he worked for NASA in public relations at the time, even announcing the occasional space launch on national TV as the "voice of mission control." Al sent back a very nice letter and his sincerity was abundant. Within three years I was into a four-year Air Force enlistment, but never dismissed the importance of the movie, "U.F.O." That's why, eventually fortunate enough to write a few national magazine articles, I broached the idea of a movie update article to Official UFO Magazine. The proposal was approved and ultimately I contacted people in some 12 states and 17 cities. The February, 1977 issue of Official UFO carried the lengthy results months later in my article, " 'UFO' Revisited," offering interviews with such movie participants as Al Chop himself, Tom Towers (the actor who played Chop), American Airlines pilot Willis T. "Doc" Sperry (experienced a dramatic UFO encounter), Maj. Dewey Fournet (original UFO project monitor for the government project) and producer Clarence Greene. A few months later, using the London pressbook's synopsis of the movie and adding a few update details here and there -- in addition to some new visuals that did not appear in the Official UFO article -- Argosy UFO carried my second piece on Clarence Greene's feature-length motion picture in its Winter 1977-78 issue. A third article, intended to complete a trilogy on the movie with focus primarily on lead actor Tom Towers, met disaster when I submitted it to Saga Magazine's UFO Report. Stuffed with rare visuals, some absolutely irreplaceable, the package was "lost in the mail" according to editors. I was devastated and gave up on the project at that point. In 2005 I was invited to write an update article on the movie for the J. Allen Hynek Center for UFO Studies, and in January, 2006 the piece appeared in Volume 30, #2 of the International UFO Reporter. In 2006, I pulled out the old unpublished article about Tom Towers, now long deceased (approx. 1991), in hope of at least memorializing this interesting man. 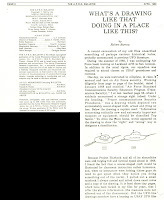 The piece appeared in August, 2006, in Volume 30, #4 of the International UFO Reporter. The movie, which used to appear sporadically on cable TV, saw release on videotape in 2000 by MGM Home Video, but it was discontinued about three years later with no DVD ever issued (the NICAP memorial web site does sell copies, with all receipts used to support this important non-profit project). Why should we care about "U.F.O." so much, and why does it represent more than just a movie? There are two enticing reasons. First, this 1956 documentary, now more than 50 years of age, is a brilliantly shining beacon that establishes and endorses the early history of UFOs in the USA -- a time when the U.S. government seemed "this close" to telling the American people that UFOs are real, with intelligence behind their maneuvers, and perhaps of extraterrestrial origin. With several former government and military people who lived the story of the UFO behind this film's production, the efforts of every serious UFO researcher who ever dared to confront the UFO enigma are legitimized forever. Second, "U.F.O." reflects American history, plain and simple. This documentary deserves a prominent spot in both the Library of Congress and the motion picture industry because of its integrity and, not to be ignored, its implications. Based soberly upon the government concern once openly exhibited for a still very much unexplained phenomenon, this old movie has the potential one day to be the most important motion picture ever made. If the U.S. government ever discloses the same facts it was on the verge of revealing in the early fifties -- with even just the minimum of details -- "U.F.O." will be the ultimate silver screen reminder that our existence, our science and our very lives pale in comparison to things we can't even imagine. If you judge me based solely upon my critical comments about the U.S. Air Force in this blog, you could easily believe I'm a military hater, consumed with destroying the Air Force image -- and you would be wrong. Remember, I was an Air Force airman for four years and gave them 100 percent of my abilities. I put a few memories into my blog, "Robert Barrow's Air Force," accessible in the link list. If anybody reads my entries here just because they can't wait for my next slap at the military, they really should go elsewhere because I'm not here to waste words destroying the armed services that keep us free, and I could never say enough about the men and women in uniform who risk their lives in situations the rest of us can hardly comprehend. Sure, I've had my disputes with the Air Force over the UFO issue. Yet, there was a time during my fleeting teenage era, a year or so before I would end up in an Air Force uniform myself, an occasion where the USAF "enlisted" my services in another respect, when something remarkable occurred. The year was 1967, a perspective in time currently consumed often in this blog, and this event elicited twists and turns that even I don't understand to this very day. See that yellow magazine cover? Click on it for a larger version. 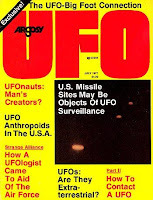 It's the July, 1977 issue of Argosy UFO, at that time one of the better national newsstand UFO periodicals. Down on the left, see that red blurb about a strange alliance and how a ufologist came to the aid of the Air Force? That's the title of my article inside -- well, I don't think that was my original title, but something Argosy UFO concocted to look good on the cover. No matter, it described the story accurately. When I wrote the piece some 10 years after the event, by then years after my USAF enlistment had come and gone, I changed all of the names, including mine, and made up names for locations. I called myself Mike Grant. You need to understand, I'm perpetually paranoid as a writer about lawsuits and people who walk the earth in a focused quest merely to make trouble for others, and this was a story not only about UFOs, but about some unpleasant UFO "investigators" of ill repute as well. Now, skip forward to 2004. In the "UFO Updates" portion of Errol Bruce-Knapp's Virtually Strange Network (see link), to my surprise, the issue of some UFO sightings in the Newfield/Ithaca area of New York State in the sixties was raised -- the very topic of my disguised Argosy UFO article in 1977. The July, 1977 issue of Argosy UFO carried my article, "Story of a Strange Alliance: How a Ufologist Came To The Aid Of The Air Force." This was the editor's cover title, not mine, because my own choice would not have been so self-serving. I took great care to change names and locations, but the piece was actually all about some Ithaca and Newfield, NY UFO reports. The UFO researcher whom I named "Mike Grant" was really myself. In 1977, I still felt uncomfortable bringing certain things to light, and made it clear from the article's opening lines that these changes had been made. Nevertheless, to reiterate the basic story outlined in the Argosy UFO article. . .
One day, sometime in the mid-sixties (forgive me, time has clouded my memory and files are hiding somewhere with sock drawer fugitives), I received an unexpected phone call in upstate NY from a stranger. Still a high school teenager, I had already been interested in UFOs for a few years and, though I wasn't quite sure where he got my phone number, I had appeared on local radio programs and had investigated the 1965 Northeast power blackout a bit, so that wasn't really an enigma. What was a mystery was his question - did I have any information on UFO sightings in Newfield, near Ithaca? No, I had none. Then the man wished to know whether I was familiar with a certain UFO investigator in that area, whom he named. Again, no was my response. The man thanked me and said goodbye. The next day, I received another call, this time from somebody with an all-too-similar calm, smooth voice, maybe with a slight southern accent. He gave his name and identified himself as an Air Force intelligence officer from Hancock Field in Syracuse. In my article, I made him a captain for reasons even I have forgotten, but I believe his actual rank was first lieutenant. In any event, I'll refer to him as "Captain Todd," as I had in my writing. The officer casually informed me that he had been "working" in this area for several weeks and had seen some of my letters to local newspapers about UFOs. He appreciated my sincere approach to the UFO topic - even though my most recent letter offered a scathing attack on recent UFO 'explanations' hastily given out by officials at Hancock Field about local sightings. Todd was sure to emphasize, however, that the USAF at Hancock Field "is not hiding anything." Todd went on to tell me that, even though there were reports ofUFOs, landings, occupants and physical evidence in the Newfield/Ithaca area, there were other Air Force officials - BlueBook? - investigating on the scene and they felt that most of the reports had no substance at all. His particular concern, however, appeared to be a couple of civilian UFO investigators who, like me, had connections with major private UFO organizations. He expressed dismay, not that they were questioning UFO witnesses, but that they were leading the witnesses in questioning, injecting suggestive comments about spaceships and aliens during the sessions. To my shock -and remember, I was just a kid, some distance away from the UFO activity in the Ithaca area - he asked if I would try to find out more information about, particularly, one of these UFO investigators. Further, Todd insisted that I not tell the private organizations about Air Force interest. He wanted me to handle all of this "diplomatically." What a dilemma this was for me, as no fan of the Air Force UFO investigation, but intensely loyal to the goals of the civilianUFO groups to which I belonged. Yet, because Captain Todd was seemingly being up front with me and extremely kind with his approach, I could only assume that what little assistance I might provide - even as a teenage UFO geek - would be the best way to go. But Todd was stern about a couple of things that he wished me to understand implicitly. First, he forbade me to use his name at all, and I was absolutely not to tell the major UFO organizations or anybody at all that the Air Force had an interest in this situation. Second, when I flat-out demanded to know whether there was physical evidence where UFOs were said to have landed, Todd insisted coldly that there was no physical evidence and there was no landing scene to investigate. This officer, if nothing else, seemed a debunking hardliner and my comments about good historical UFO cases were all dismissed by him. After this initial forty minute conversation, Capt. Todd informed me he was preparing a report on the supposedly tainted civilian investigators - for whom, I don't know - and as this, the first of numerous phone conversations, ended, he gave me two numbers where I could reach him - one seemed in error, but the other worked fine. But I wasn't about to let this go by so easily. Among my interests was the - now defunct - NORAD installation at HancockField, the SAGE (Semi-Automatic Ground Environment) building, a windowless facility that housed the highest of high-tech equipment for tracking who-knows-what entering the air space of the United States. Call me a foolish kid, call me an idiot, butI decided to bargain a little. I expressed to Capt. Todd that, in return for my services, wouldn't it be great if I could get into the SAGE facility to see what that place is all about? To my amazement, Todd said he thought that could be arranged! Ultimately, I found that there apparently were some underhanded things going on via some civilian investigators in theNewfield/Ithaca area. An official of one of the major UFO organizations, knowing only that I was looking into the technique of certain investigators, repeated to me several times during a phone conversation regarding one that he "is a weird person, he's just weird." Indeed, that organization had received other complaints about this member. One Sunday evening, Todd phoned to tell me he was imformed that a team of university scientists (re the Colorado UFO study) was coming to Newfield to conduct a UFO investigation. For some reason, he found this difficult to believe, though he was aware that a Project Blue Book consultant had been there a few days before. A few hours later, I confirmed that the team was coming and relayed this information to Capt. Todd. Now, here's the really, really peculiar part: Upon hearing that the team was coming, the officer's voice became extremely concerned and he explained to me again that he anticipated complete and absolute secrecy regarding our contacts. "Neither I nor the others at my office want to be associated with the investigation in any way, at any time," he demanded. Then the bombshell hit: "Bob, I want you to know something. I'm not even supposed to be talking with you. The public information office here at Hancock Field doesn't even know I am speaking with you." By this time, I had come to realize that Todd was working with at least two other people. One was a high-ranking NCO, and the other a woman, perhaps an officer, or maybe enlisted. I spoke with her only once, but had numerous conversations with the sergeant. As days went by, the civilian "investigators" in question decided to come to nearby Syracuse to appear with local media and to conduct public meetings about their "findings." I was asked to appear with them on some program, but I obviously declined because I wished to safeguard my own reputation in addition to being in the uncomfortable position of checking these people out. By now, first one, and then both major national UFO organizations with whom these people had become affiliated were blazing angry over their affiliations and were taking steps to distance themselves. I spoke with reporters sent to cover the civilian investigators. One told me of a meeting in which a few hand-picked and easily influenced UFO witnesses were brought along, and he remarkedthat one of the investigators just seemed "very weird" to him. As things progressed, the civilian investigators in question even formed their own UFO investigative organization and they were soliciting membership fees. Capt. Todd, in his latest conversations with me, began to lose his cool. He had become extremely upset that the civilian group leaders were criticizing his own now-apparent investigations in the Ithaca/Newfield area, and he seemed worried that his formerly low profile regarding the AirForce investigation had surfaced. I asked Capt. Todd, during a phone conversation in which he was quite emotional and disturbed, what in the world was wrong? "Trouble." he replied. "Wright-Patterson found out that (the civilian investigators) were screaming about our investigation in Newfield." So what, I wondered? "That's the problem," Todd returned. "Wright-Patt called me and wanted to know why I was down there." "Didn't they know why?" I asked, now absolutely confused. "I told them I was ordered to go," he shot back. "I thought they -- Blue Book -- ordered you to go," I said. The phone conversation ended abruptly. He would not speak further with me on this occasion. Capt. Todd, or First Lt. Whomever, he was off the phone, click. One of the newspaper reporters called me later in the evening to tell me the university scientists had arrived and were staying at a certain inn, being mobbed by the press and the curious. However, when I called the inn, the clerk insisted that there was no "mob scene" and that if scientists had arrived, he knew nothing about them being there. When I reinitiated contact with Capt. Todd later in the evening ,I discovered that while the clerk at the inn was telling me there were no scientists in town, as a matter of fact one of those non-existent scientists had just spoken with the captain on the phone. The scientists (probably affiliated with the University of Colorado UFO project which ultimately ended in disaster) looked into the UFO situation, publicly claimed disappointment with their findings and left town. The civilian "investigators" cried foul to the press, seething particularly about the formerly reclusive Capt. Todd's investigations, and went about the business of raising funds for their new UFO research group -- perhaps unaware by this time that the New York State Attorney General's Office was getting complaints about the use of members' money and an investigation was underway. Eventually, the civilian investigators, having already been thrown out of the two major UFO organizations, were brought up on criminal charges by the State of NY and they were effectively prosecuted for scamming people out of their money. They had also told some fantastic lies, even claiming a veritable father-son relationship with Project Blue Book personnel as they used their pied-piper personalities to entwine the UFO faithful into parting with their cash. As if a light switch was turned off, I instantly lost all contact with Capt. Todd. He was simply gone. However, the weeks passed and suddenly, one winter's morning, someone claiming to be an Air Force officer called my home while I was out. The name was not taken and he did not call back. A couple of weeks later, I phoned the Hancock Field phone number that I knew so well by then. A familiar voice answered; it was the sergeant whom I had spoken with many times. He confirmed that Capt. Todd had transferred to a new assignment in some other state about a month earlier. As we spoke, the NCO confided that he very much wished he could give me his personal opinion about the nature of UFOs, but felt it best not to do so. "But,"he offered, "I'm sure my opinions would be much the same as yours." Postscript: You, dear reader, probably believe this incredibly convoluted story of confusion and intrigue has now ended. Not true. A few days later, I received a phone call from the public information office at Hancock Field in Syracuse. Wherever he had gone, whatever he had become or was in the first place, the mysterious Capt. Todd -- rather, First Lt. Whomever -- had not forgotten his promise. He had asked the sergeant to make arrangements for me to tour the SAGE installation. After one delay and questions of security complications due to the nature of the tour, I gained my precious entrance into the world ofNORAD. The installation no longer graces the grounds of Hancock Field, but I can say that it was a fantastic experience to watch it work from the inside. I and what seemed primarily a group of Japanese officials or scientists were guided through the building, shown what were then giant freezer-sized computers and ultimately the auditorium-sized room with the big NORAD Screen on the wall that we've all seen in those old movies. The radar, all the officers, airmen and WAFs sitting at their duty stations, the speaker-generated sounds of multiple voice communications coming and going from all over the country and overseas as the huge screen before us awaited friend and foe alike - well, it was all pretty darned impressive. And for me, something equally as impressive happened when I first walked into the SAGE building. I was actually greeted by the sergeant, his name tag reading exactly who he said he was many months ago. No kid was this, either, he was a chief master sergeant, on the verge of retirement. The lines on his face spoke of experiences of which most can only dream. Despite all of the confusion and the things that will never be explained to my satisfaction regarding theIthaca/Newfield UFO situation, few could ever know what a comfort it was to me just to see a tag with a name that at least seemed real. Chief master sergeant such-and-such (of course, I remember real names to this day) was real. Whatever I had experienced was official and absolutely meaningful and real. I haven't spent a lot of time thinking about the Ithaca/Newfield UFO sightings over the years, which I personally believe have a basis. Back then, I had to finish high school and then, in an era where both the Rev. Martin Luther King and Robert Kennedy were assassinated as the USA slipped further into the turmoil of Vietnam, the military draft began biting at my heels. With only two college courses completed, a week before the final draft notice arrived I entered the Air Force as an enlistee. If anybody thinks I was rewarded further for helping the enigmatic young Air Force officer, my addendum would be that my Air Force recruiter promised me photography school. Instead, I was trained as a medic. Once upon a time, the name DELL was not synonymous with computers. Dell Publishing Co. was a major publisher of books as well as magazines, and in fact the company, like so many publishers, has merged with another print conglomerate. Back in the sixties, for a brief time, Dell ventured into the UFO area and published an occasional magazine on the subject. I don't recall how many, maybe four in total, but not many, at any rate. In late 1967 I wrote Dell about the importance of the 1956 United Artists motion picture, "U.F.O." and encouraged them to offer something about it in their periodical. What an unpleasant surprise I received, however, when a Dell representative replied with the news that its UFO magazine would appear no more. Assurance was offered that I would be contacted if anything were to see print in the future, but that's the end of the story at this point, for I never heard from them again. If there were future Dell UFO periodicals, which there may be, they don't come to mind at the moment -- but I'll likely find them in a box someday, long forgotten, if they exist. 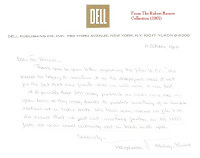 Just for history's sake, I'm including the Dell letter and its once familiar letterhead logo here, with apologies that I can't seem to offer a more enhanced copy of its text (the original is very faint now, some 40 years later). What did the NY State Troopers See? At least two members of the New York State Police saw something strange in the summer skies of 1967, and as long as I'm currently pulling out documents from that year, I thought we would just throw this out for your interest. Displayed here is, first, a copy of a TV news script page of August 2, 1967, as read by Syracuse Channel 9 TV news anchor Stan Redmond. There are misspellings on the page of both Massena, NY and an officer's name. Channel 9 was known as WNYS-TV, but the station since then has changed its call letters at least twice and another area TV station eventually adopted the WNYS designation; even I get confused with these broadcast musical chairs after awhile. Anyway. . . This news report suggests the observation of something "resembling a meteorite," and the possibility of some rare celestial event comes to mind. Yet, we have apparent confirmation that this thing was tracked on radar. Also of interest is the reference to a previous sighting. The second visual here is a letter I received from one of the New York State troopers who witnessed the sighting, and he offers an observational time frame of 10-15 seconds -- much too long for most meteorite incidents, which usually consume only a fraction of a second, or maybe two. A 10-15 second time period would be an eternity for a standard meteorite event. And obviously the comet theory fails because comets seem to hover almost motionless in the sky to the casual observer. Radar? A lengthy observation time? A flaming tail or sparks? Could it have been a blazing re-entry of "space junk?" Was this just a meteorological event -- or something more? 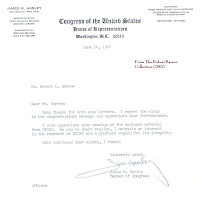 A little error occurred in 1967 when Congressman James Hanley congratulated me in a letter intended for another person. When I brought the mistake to his office's attention, the response (shown here) included a compliment regarding NICAP's integrity. Apparently, as time went on, he was becoming increasingly familiar with the UFO evidence, and often mentioned the subject in his letters. 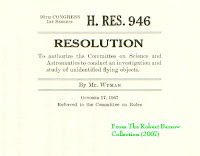 The congressman's other letter here accompanied a brief government document dated October 17, 1967, in which Congressman Wyman requests House Committee on Science and Astronautics hearings to look into the UFO issue, as many in Congress by then had become frustrated with both the Air Force's and Colorado University's (Condon) negative position on UFOs. The consensus among some thinking members of the House was that Colorado had ignored the evidence (true), the Air Force was concealing information and something needed to be done. 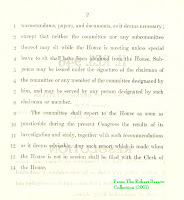 Rep. Hanley was not optimistic about the proposal, but indeed there were hearings held in 1968. Well, there was a hearing held -- a one day hearing. Actually, it wasn't even called a hearing; instead, the designation symposium was substituted. And what a pathetic event this turned out to be! 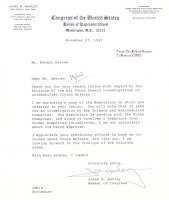 As sterile as a neutered cat, the proceedings allowed for no criticism of either the Air Force or the Colorado University UFO investigation, NICAP representatives were not allowed to present UFO evidence or ask questions, and even members of the press were silenced, unable to address any issues of importance that cried out for attention. Obviously, this instance of government, at whatever level, clamping down on its own efforts to gather facts, prevented a golden opportunity to bring evidence forward, even with the presence of such notables as astronomer Dr. J. Allen Hynek and physicists Dr. James McDonald and Stanton Friedman. This was not a hearing as much as a muzzling intended by certain congressional members -- and perhaps others unknown. 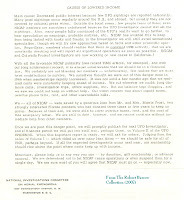 The National Investigations Committee on Aerial Phenomena (NICAP) had enjoyed a steady and sometimes dramatic spurt in membership since 1964, when the Socorro, NM UFO landing case thrilled and enticed the nation's newspapers and broadcast news outlets. Nor did the years 1965 and 1966 disappoint. In fact, from 1964 through 1966 a bounty of impressive UFO cases from around the world received widespread press coverage, and organizations such as NICAP were the recipients of previously unseen funding and membership support. However, by way of a very short leap to 1967 the situation quickly began to alter. The sightings continued, but the media had moved on to other matters, such as the horrible Vietnam conflict and related unrest in the U.S. Further, Dr. Edward Condon and his Air Force-financed Colorado UFO project appeared to be hard at work investigating UFOs, probably satisfying media and public concerns that, at long last, a capable independent research entity with government backing would get to the bottom of the UFO issue. Whatever series of events gathered to lessen interest in UFOs, NICAP was the first to suffer -- maybe, in some ways, because its resources were supposedly being shared with Colorado, and a faulty perception came about that NICAP likewise shared in government funding (which was never the case). By August of 1967, the NICAP economic situation was dire, and director Maj. Donald E. Keyhoe (USMC, ret. ), proud military veteran, accomplished writer, former aide to and biographer of famed aviator Charles Lindbergh (see his book, Flying With Lindbergh, 1928, since reprinted), was forced to beg for NICAP's life as if holding a tin cup on a street corner. NICAP survived, but from that point on funding was always tenuous, and once the "Condon Report" emerged NICAP's internal operations started to unravel with occasional strange twists over a period of several years until the organization's demise. Details are abundantly presented at the nicap.org Web site.